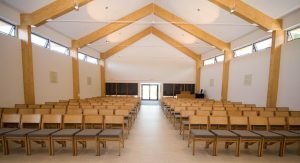 Baldarroch is one of Scotland’s newest and Aberdeenshire’s only purpose built crematorium. The chapel is modern, light and airy with the wooden pillars and beams giving a natural look. Unlike other crematoria Baldarroch does not have a catafalque (a platform on which a coffin rests). Instead, an antique Chapel Bier which dates back to Braemar in the 19th century and is the main focal point in the chapel. The furniture in the chapel has been chosen to compliment the wooden pillars and beams and of course the Chapel Bier. 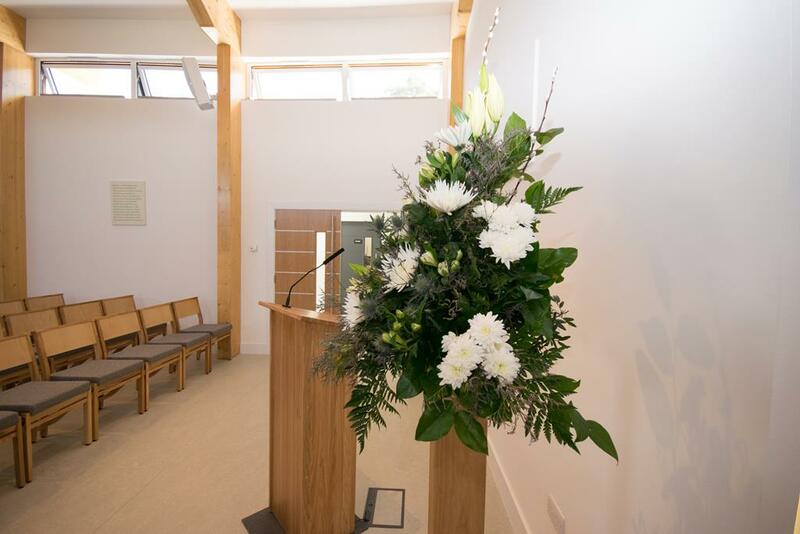 The weekly floral displays compliment what is already stunningly beautiful chapel and a fitting place to say goodbye to your loved one. 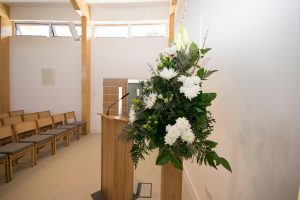 The verses and poems that adorn the walls of the chapel, family room and corridors are tasteful and thought provoking. We are able to seat 154 people with standing space for approximately 80 mourners. 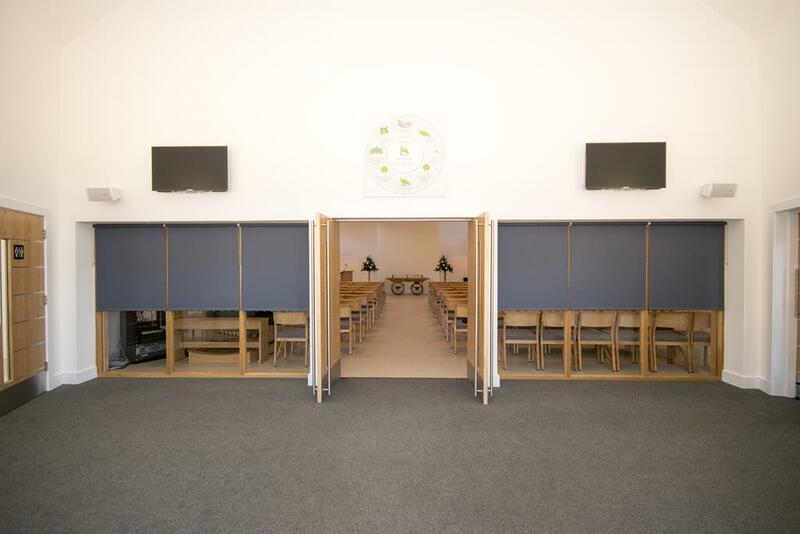 Speakers are located throughout the building and outside areas allowing larger attendances to be catered for. 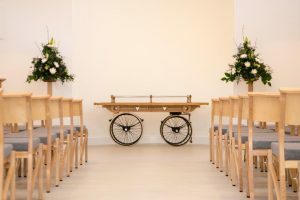 A family room is available for the use by the immediate family of the deceased prior to and immediately after the funeral service. 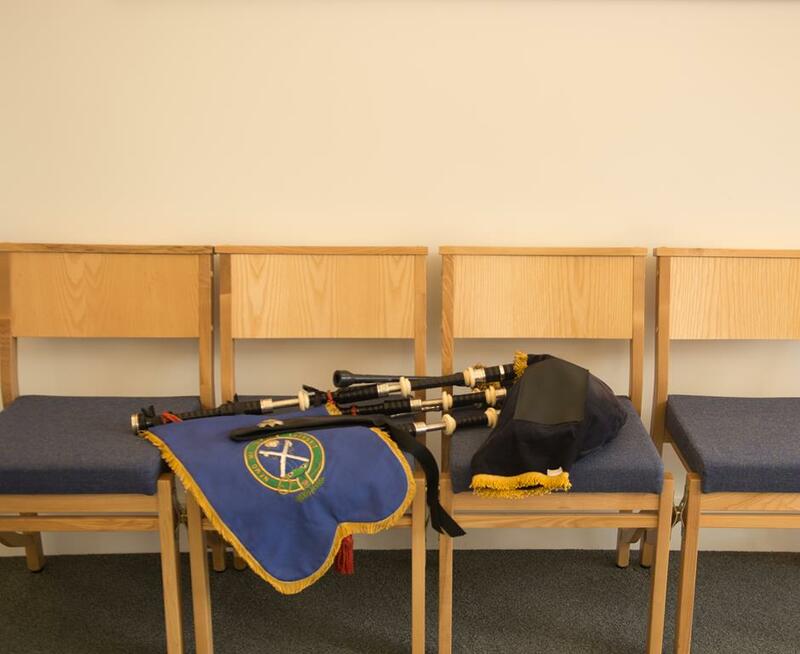 We allow 1 hour and 30 minutes between each service which allows approximately half an hour within the chapel with time either side for people to get settled and to leave unhurried. This ensures that every family has enough time to hold a personal and dignified service. 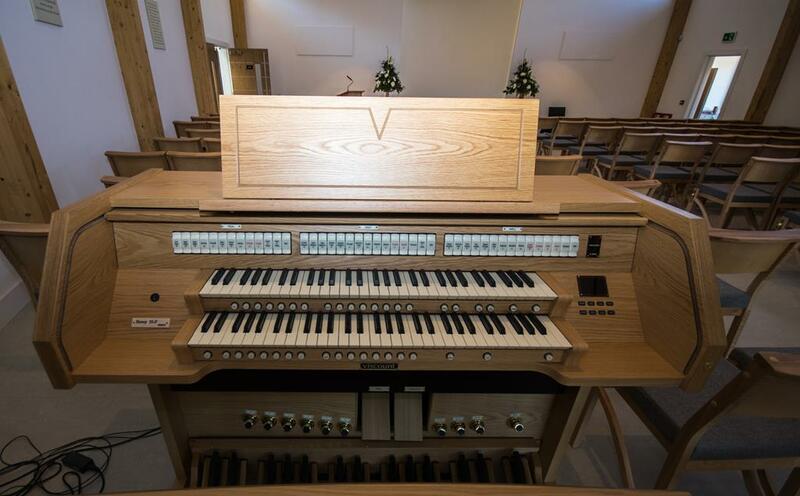 An integrated state of the art audio and visual system provides us with an ever increasing music library which currently sits in the region of 12000 pieces of music. 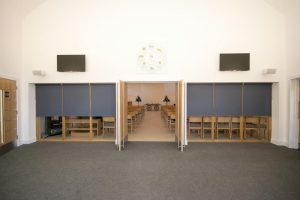 The system also allows us to shown slideshows or videos on the two 75″ TV screens in the Chapel and the two TV screens in the Foyer. Tradition is not forgotten though and the multi faith chapel is fitted with a Viscount Envoy 35-F organ. All forms of music are welcome and our team will be pleased to offer any advice you may require. We aim to provide the best possible level of service. Please do not hesitate to contact us if we can help you in any way regarding your audio or visual requirements. The floral tribute area is set next to the handshaking area on the right hand side of the building. Floral tributes will remain on display outside for a minimum seven days. There is car parking for 55 cars of which 5 are set aside for disabled parking. In addition there is ‘over-flow’ car parking for approximately 50 vehicles. 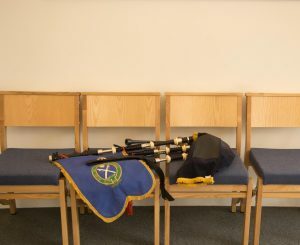 Additional parking is also available at Crathes Village Hall if required. Under no circumstances should vehicles be parked on the grass verges directly outside the crematorium grounds. Cyclists have not been forgotten with 4 bicycle stands being located next to the disabled parking bays. Disabled Parking for 5 vehicles. Wheelchair friendly same level access throughout the building (i.e. no steps or stairs). 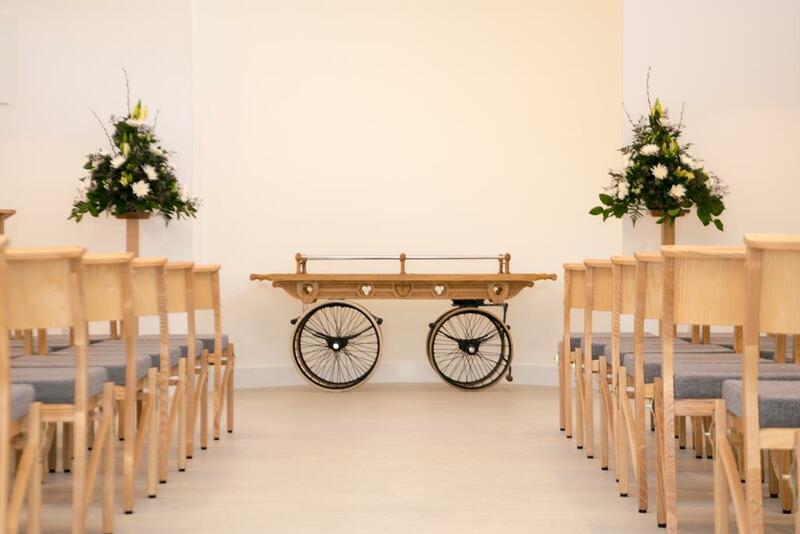 A spare wheelchair is available within crematorium.